The Nikon 50mm f/1.8 G AF-S Lens delivers stunning image quality and has a fast maximum aperture of f/1.8, making this lens an excellent choice for low-light situations or when shallow depth of field is required. A dedicated Silent Wave Motor (SWM) ensures discreet but accurate autofocus. 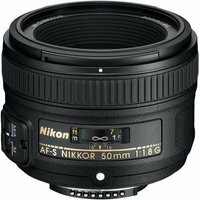 The Nikon 50mm f/1.8 G AF-S Lens is compatible with both Nikon FX and DX format DSLRs.